Surge protector: What are they? What to look for while buying one? Many people complain that their television or electronic appliance got “burnt” as the voltage shot up suddenly. By saying “burnt” they obviously don’t mean that it was caught up in flames, but they refer to a very common phenomenon of an appliance becoming non-functional all of a sudden due to a drastic fluctuation in the incoming voltage. When the voltage increases abruptly to a very high value for a very short span of time, it is referred to as voltage surges. Voltage Spike: What and How? A voltage spike may be caused due to a number of reasons. It may be due to short-circuits, striking of lightning, power outages or sometimes due to a malfunction in the electricity provider. What can I do to protect my appliances against voltage surges? Fortunately appliances can be protected from voltage spikes by using a device called surge protectors. Although surge protectors do not always protect against the voltage spike due to lightning, they definitely guard the appliances against voltage spikes caused due to the rest of the reasons mentioned above. What are surge protectors and how do surge protectors work? As the name clearly suggests, a surge protector is a device that protects or shields your appliances against a voltage surge/ voltage spike (consequently a current spike). 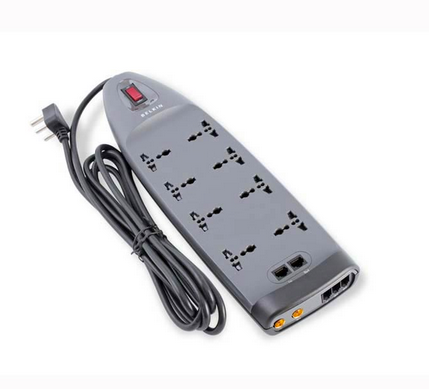 A lot of people use surge protectors to provide power supply to desktop computers, television etc. When the voltage increases beyond a certain level, the surge protector either blocks or transfers the excess energy to the ground. By doing this, it ensures that the appliances connected to it do not get affected or broken down due to a voltage surge. What to look for while buying a surge protector? Joule rating: Joule rating is the most important feature that you should check on while buying a surge protector. It is basically the measure of energy absorption or energy dissipation of the surge protector. It is given in Joules (J). It is the maximum value of the energy which the surge protector can absorb without failing. So it goes without saying that a higher joule rating suggests that the particular surge protector is able to offer better protection to your appliances. This value ranges from 200 Joules (for a generic surge protector) to above 1000 Joules. In fact in some surge protectors the manufacturer provides a lifetime warranty on the appliances connected to it, if the appliances fail owing to a voltage surge. Obviously such surge protectors are costlier than the regular ones and have high joule rating. Always try to buy a surge protector with high joule rating for better protection of appliances. Clamping Voltage (Let Through voltage): Clamping voltage is that value of the voltage beyond which the surge protector absorbs (or grounds) the excess energy flowing through it. In other words, it is the maximum voltage that the surge protector will allow to flow through it before absorbing (or blocking or dissipating) the excess energy. Say you have an appliance which operates in the range of 200 V to 240 V, then a surge protector rated at 240 V is best suited for you because if during a voltage surge, the voltage goes beyond 240 V then the surge protector will absorb the access the energy and thus will protect your appliances from any damage. Response time: When there is a voltage surge, the surge protector does not start instantly. It takes some time before it kicks in. This time period between the instant the power surge starts and the instant the surge protector starts functioning is called the response time. Although the time period about which we are talking here is of a few nanoseconds only, but it is enough to damage the appliances. Lesser the response time, lesser is the time for which the appliances run on the spiked voltage and hence, safer are the appliances. There are many brands which are coming up with different models of surge protectors which have different technical specifications. So it is advised that you should first thoroughly understand what your requirements are before buying a surge protector. Belkin and GM are popular brands currently available in market. Voltage surge is a phenomenon which you can do nothing to prevent from occurring. This is because the reasons which cause a voltage surge (like striking of lightning, a short circuit etc.) are beyond your control. So it is best to opt for a solution which protect your appliances from voltage surges. A surge protector does just the same. Before buying a surge protector, it is important to understand what your requirements are as it would facilitate better judgment in this regard.